2014 Suzuki Access 125 Special Edition. Picture credits - Suzuki. Submit more pictures. 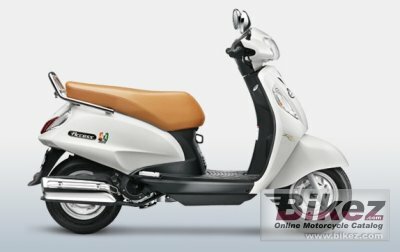 In addition to its sporty, stunning and stylish design, ACCESS is equipped with many other attractive features such as Powerful 125cc Engine for enhanced performance and excellent riding quality and central locking system and unique shutter mechanism for a single control point for the entire machine to avoid theft. For safety and convenience, this motor scooter is equipped with unique multi-reflector headlamp with focused and brighter vision. Ask questions Join the 14 Suzuki Access 125 Special Edition discussion group or the general Suzuki discussion group.